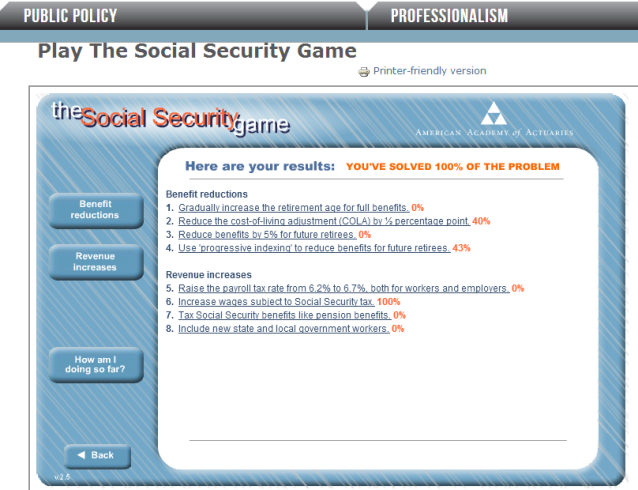 Views under the Palm | johnmpoole.com: Fixing Social Security is Easy! The Politics is Hard! Fixing Social Security is Easy! The Politics is Hard! Embrace Your Mistakes - Bloomberg View: "Anyone looking to make sure the retirement fund can meet its obligations should consider the following options: Raise the payroll-tax rate, raise the ceiling on taxable income, increase the retirement age, means test benefits, tax benefits, lower the cost-of-living adjustment, reduce benefits, or any combination of the above. The American Academy of Actuaries has even set up a dashboard where you can tweak these approaches. It turns out to be surprisingly easy to numerically make Social Security very solvent. It’s the politics that are so challenging."